I've always disliked the term “virtual"to describe a remote assistant assistant.” Prialto is about real people supporting your tech enabled life. We aren’t a marketplace. And our services cost more than $300 per month. Though our productivity assistants do “virtually” commute into offices in San Francisco, New York, LA, Boston, and Seattle, there is nothing virtual about the assistants themselves. Our people are at least a third of Prialto’s productivity solution, and they are real. They have pasts and futures, family and friends, bills to pay, hobbies, feelings, highs and lows. They need motivation to do good work and they need inspiration to grow. Virtual implies the absence of all of that. The word “virtual” literally means simulated or not real. In the case of remote assistants, it’s become shorthand for describing people who work as if they’re powered only by software or a computing algorithm. You put in a project and they spit out a result. It’s predictable, easy and uncomplicated. But Prialto is no SaaS app. Though we continually evaluate and adopt the best software tools out there, our people are what allow us to take the work we’re assigned to the next level. Despite all the complexities in leveraging human input, people still do judgment, intuition and contextual understanding better than any other tool. We don’t hang out in marketplaces. Marketplaces are liquidity pools that require tremendous scale to work. When they do work, they are very cool. They are great for trading physical goods and financial products. They are also sometimes useful for buying services, if those services are tightly defined and require little ongoing context. At their best, Elance and ODesk are great examples. But marketplaces don’t work for intricate, relationship-based services like the ones Prialto provides. Yes, you may be able to wrangle some exceptional work out of those “virtual” services you picked up in a marketplace IF you have lots of time on your hands and are able to deal with the self-serve challenges. That begs the question, though, if you have such time, why would you pay a transaction fee for the time-efficiency of the market? The answer is that you wouldn’t. People who have the time will pay very little for the efficiency. That’s why freelance marketplaces operate on such thin margins. Marketplaces don’t work for more complex, ever-changing and relationship-based services. Those require an intimacy of knowledge and trust that is in direct opposition to the anonymity of the marketplace. 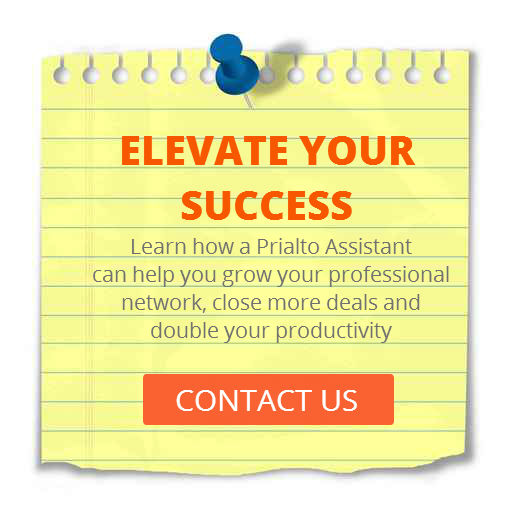 Prialto’s turnkey administrative services cannot work with either a “virtual” or marketplace model. A few dollars per month may buy you help with setting up a restaurant reservation or trolling for a good buy on Craigslist. But our serious, busy members and their growing companies are in need of more than the novelty of delegating a few one-off tasks. We love Ferris Bueller, and we even think Tim Ferris has some cool things to say. We simply are not in the business of helping executives to labor arbitrage into an extra day off. Our members love their work enough to do it for much more than four hours a week, and they depend on us to help focus on what drives them to work so hard. Where our turnkey services come in is when these members don’t have time to slow way down to figure out what they can meaningfully delegate. We are passionate about helping our members figure this out, but it’s hard work. It is only worth doing for executives who have more than just a few hours a month of need. If one breaks it down hourly – and we don’t -- we actually only charge a few percent more than those companies advertising low monthly rates. Our members know that the few extra percent is well worth the experience, passion and knowledge that we bring to each engagement. So are we virtual? Absolutely not. And, by-the-way, neither are any of the assistants at other companies that call them virtual assistants. These companies are capitalizing on the concept of getting things done easily and quickly, but they don’t actually do anything difficult for you. Prialto takes complexity seriously. We are passionate about simplifying that complexity for busy people, and it is hard work. That’s why it is valuable for us to do it.